In recent years, mankind has made giant steps forward for medicine thanks to modern technology and intricate research in molecular biology, genetics, pharmacology and computer technology. These achievements have given new opportunities in diagnostics and treatment, although they still require highly qualified specialists in each field. Our journal puts an effort to make fundamental innovations available for all medical practitioners. 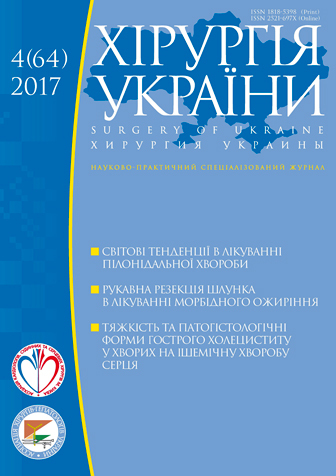 It has been sixteen long years since the first issue of journal “Surgery of Ukraine” was published. However, today we are proud to say, it has become a significant information source. The journal features original articles dedicated to cross-disciplined results in surgery, reviews and reviews of monographs, dissertations, bibliographical materials from Ukraine`s leading scientists. The editorial staff including reviewers and authors are writing for a wide readership. The journal also reflects the research findings from leading Ukrainian scientists and foreign experts. The key goal of journal is to make a strong bond between fundamental research in cutting-edge medical technology and its practical applications as well as highlight about important work reported all over the world. In this way, our journal traditionally aims to be the open platform where scientists together with practitioners are able to discuss the open questions on fundamental basis and application of medical knowledge. I strongly hope, the journal will be useful not only for experienced researchers, but students and young scientists who show great concern over integrating multidisciplinary knowledge. We invite authors to join hands with us and looking forward to papers that describe the most significant research in all areas of surgery. Thank you to all the members of Editorial and Advisory board of our journal! We greatly appreciate the work that all of you have done. To our future authors, we wish all the best in their research. For the high scientific level, topicality the journal has the status of a professional scientific issue approved by the Presidium of the Higher Attestation Commission of Ukraine and is included in metric systems Science Index and Google Scholar.